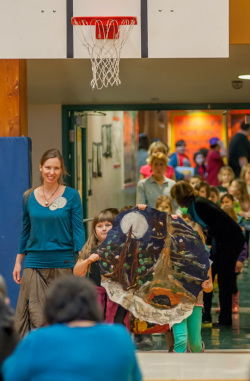 A 3 month art project involving Kindergarten (some mixed Grade1/2) classes of all six elementary schools on Haida Gwaii, BC. 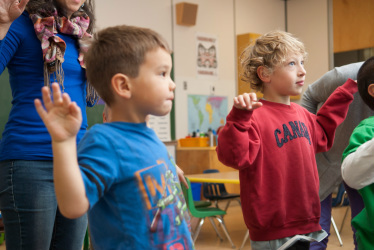 The project is supported by School District 50 Haida Gwaii, Literacy Haida Gwaii and major funding was provided by ArtStarts in Schools. Taan means bear in the Haida Language. 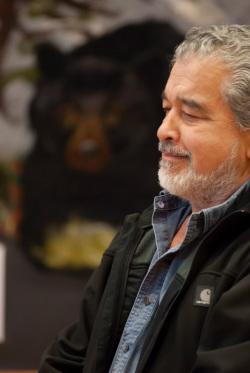 This project acknowledges and is grounded in traditional Haida knowledge. The Haida have several ways to describe the cycles of the moon. The version on which this project is based has been recorded by Joanne Yovanovich in the book 'Tluuwaay 'Waadluxan' and can also be found in a publication by Robert Cogo called 'Haida Months of the Year' (1979). 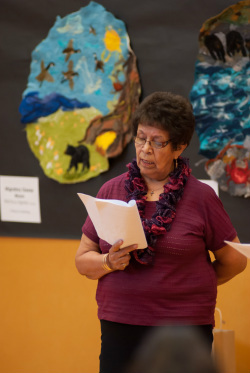 Alison Gear, a local writer and an early learning coordinator for School District 50 Haida Gwaii, was inspired by the traditional Haida descriptions. 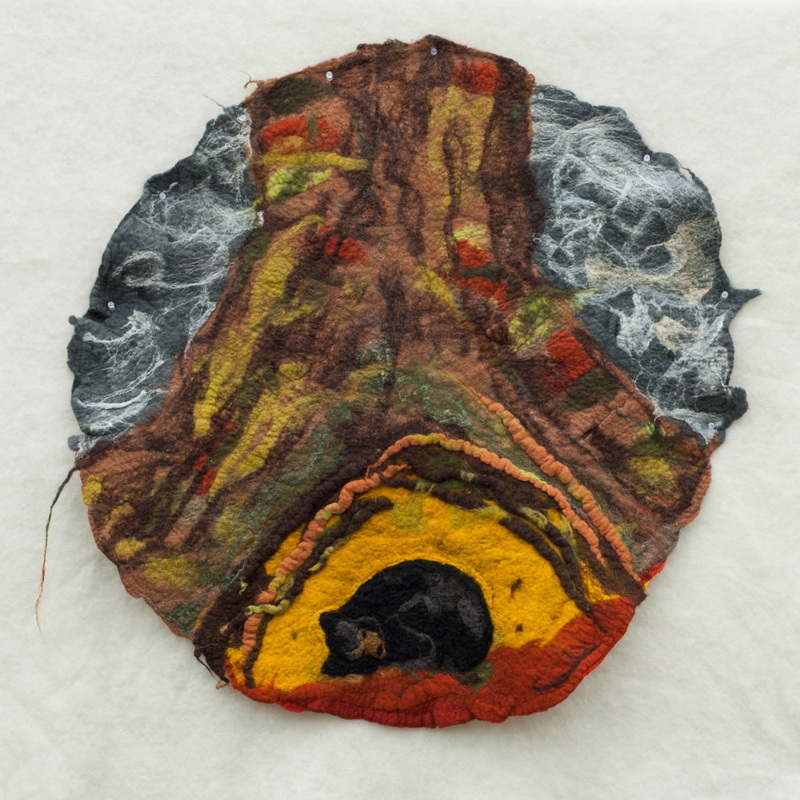 She wrote a poem called Taan's Moons, describing twelve moons through the eyes of a bear (Taan). 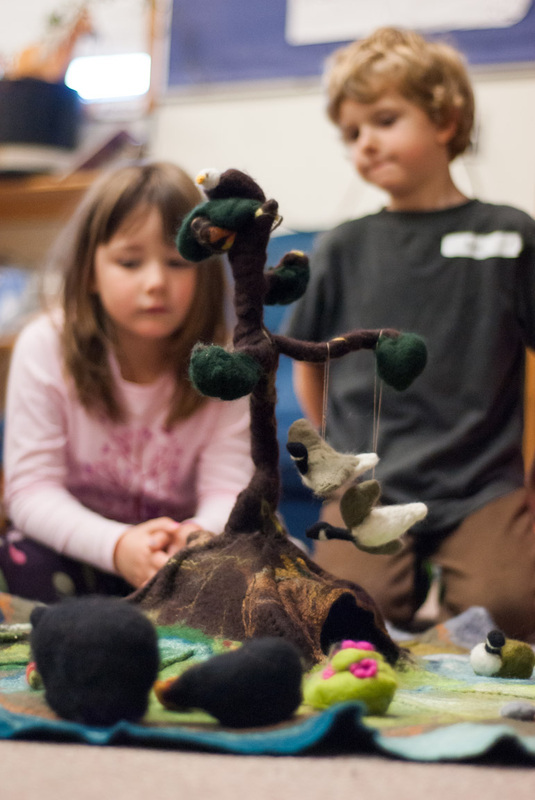 Alison invited Kiki to embark on a creative journey to find a way to illustrate her poem through felt creations with the help of the children of Haida Gwaii. 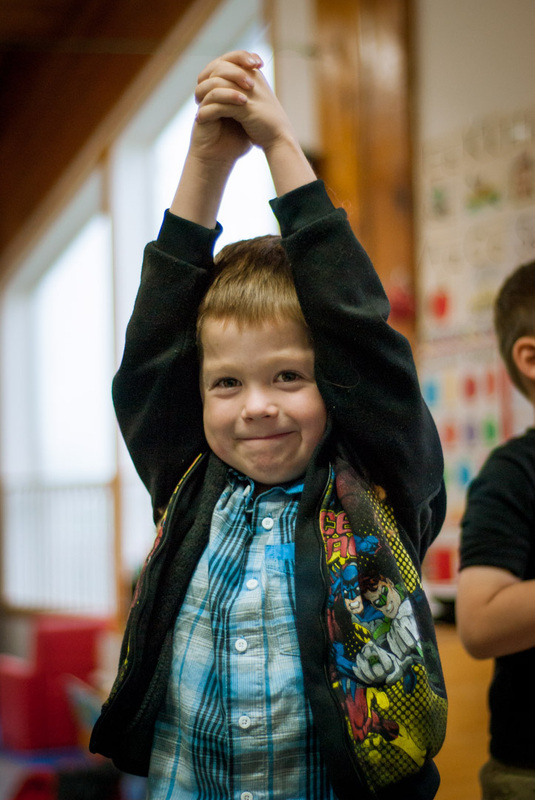 Alison and Kiki put a proposal together to work with the kindergarten (or K/1/2) classes of the six elementary schools of Haida Gwaii. 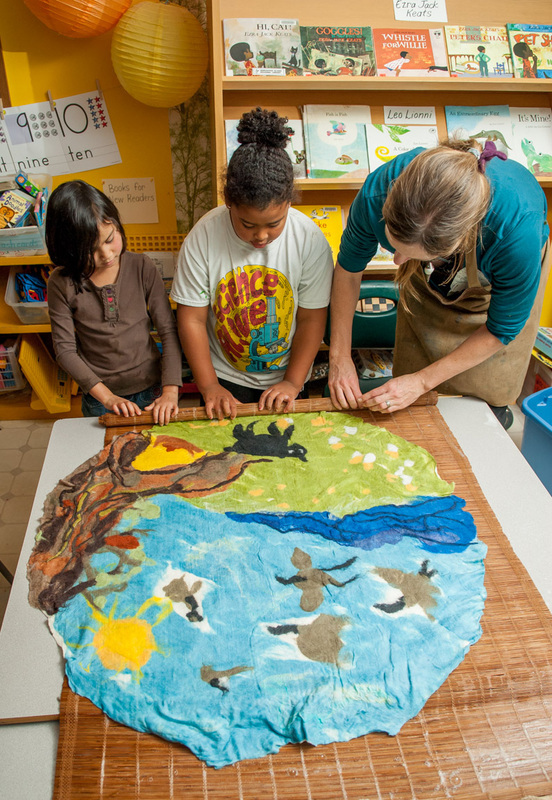 In the Fall of 2013, 70 students worked with Kiki and Alison to create thirteen large felted moons as illustrations for the poem. Each class was responsible for at least two moons. 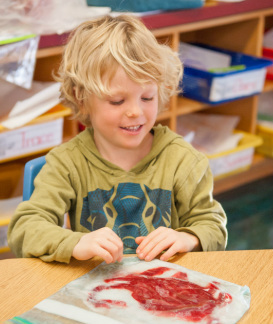 They engaged in language arts activities including felt board stories, memory card games, and writing exercises, as well as math exercises, movement, drama and many felting and drawing activities. Photographer Jason Shafto documented the process. Alison and Kiki visited each school to meet the teachers and children to introduce them to the project. 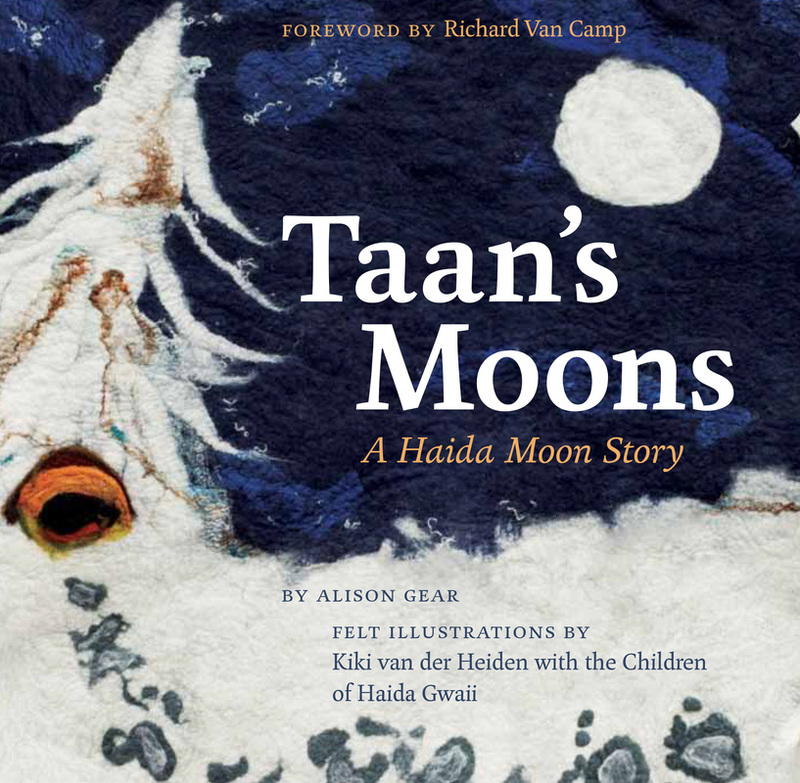 They all embarked on their first creative explorations of the Taan's Moons story. Each session started with 'Story Yoga' to warm up our imagination. 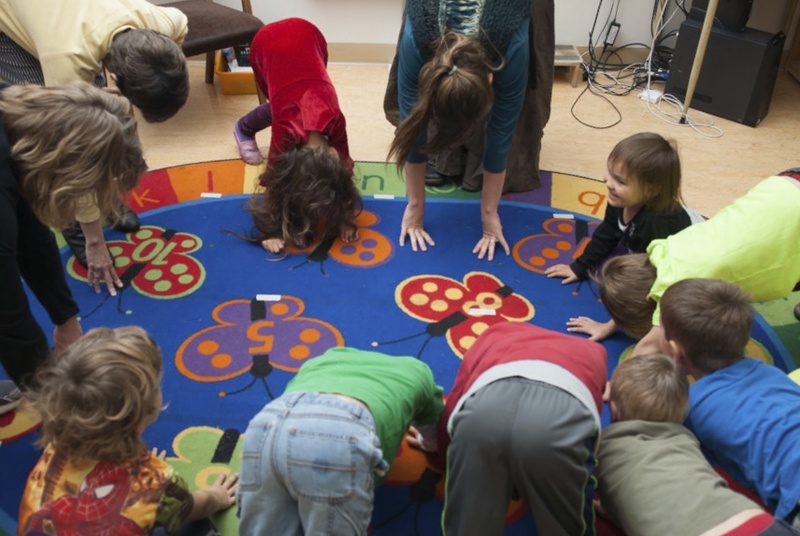 Kiki led the children through yoga movements that represented each stage of the Taan's Moons story. We started with yoga's Child Pose which we called "Bear Hibernating" pose. We moved through the arrival of geese, Taan feeding on crabs, berries and fish, to shaking like a cedar tree, and back to hibernating. 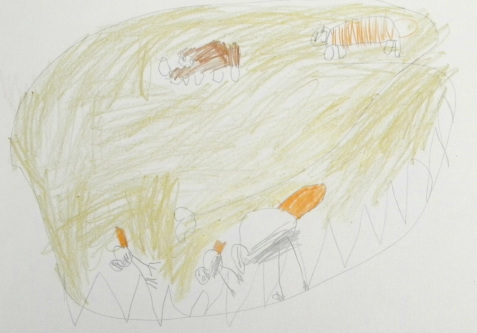 As the story resonated in their bodies, we invited the children to make a drawing of their part of the story. They created their own unique version of the story. These drawings played a central role in the design of the thirteen felt moons. 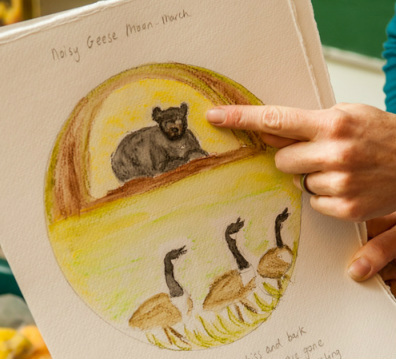 Based on their drawings and stories, Kiki created circular sketches for the moons. For example, in 'Noisy Geese Moon' on of the children drew three noisy geese in front of the bear's den. He said, "The geese are waking up the bear." In October, Alison and Kiki spent a full day at each of the six elementary schools. They brought various activities to the classrooms to familiarize the children with elements of the Taan's Moons story. 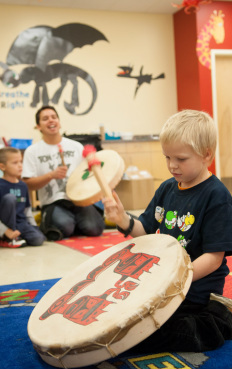 Examples below are the Felt Board Story and memory game created by Alison, and Haida dance, drumming and singing. 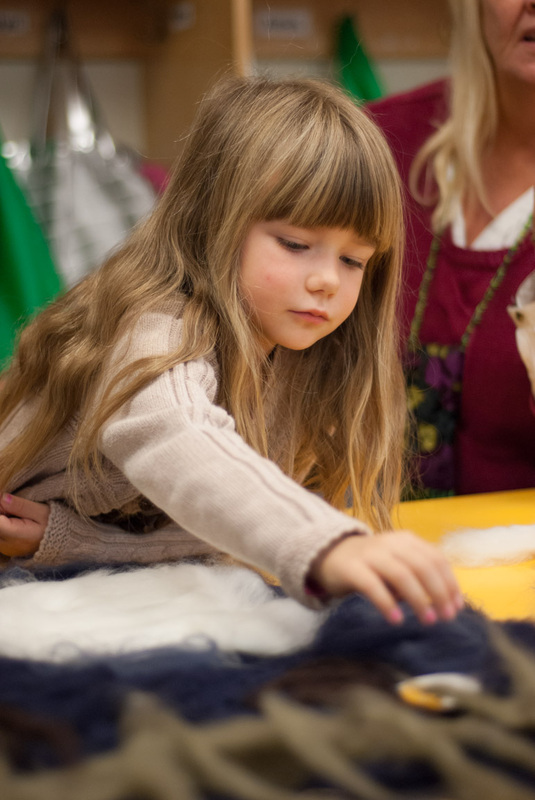 During this day, the children were introduced to wool and their first exercises in felting. 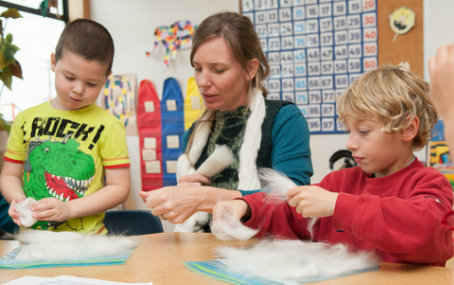 They learned about different types of sheep and how each type has a unique kind of wool. 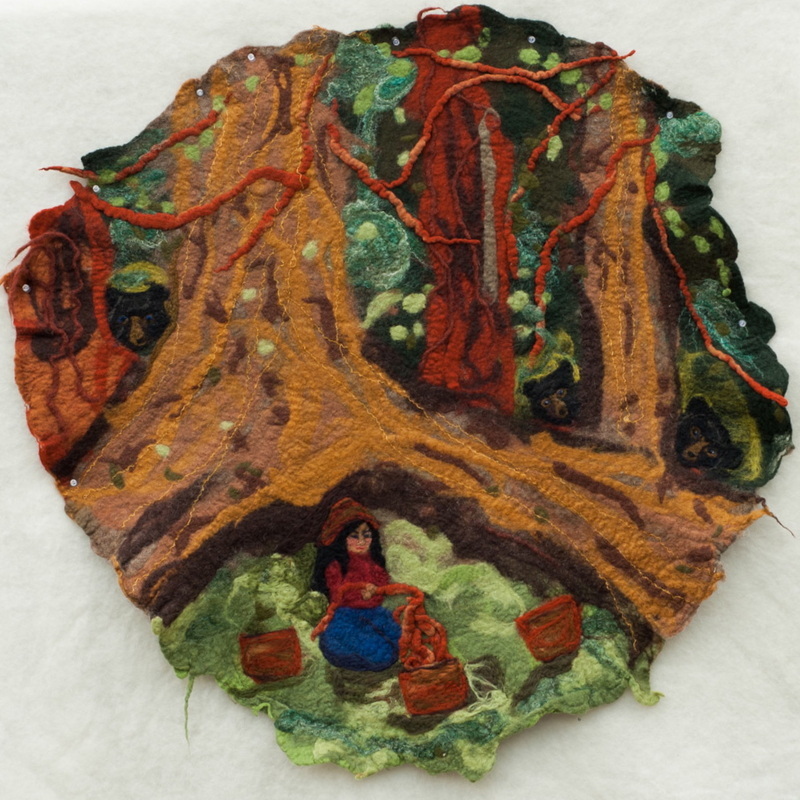 The students created many felted elements - berries, roots, seaweed, branches, squares - to be incorporated into large felted moons in a later session. In November, Kiki and Alison spent another full day with each class. 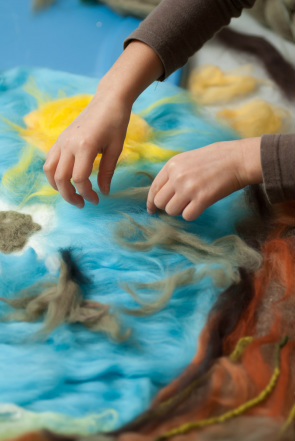 Incorporating felted elements from the last session, we composed large felt moons illustrating each verse of Taan's Moons. 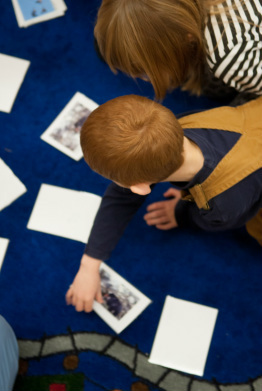 Rotating groups of four students worked with Kiki creating the moons throughout the day, while the rest of the class worked with Alison, teachers and volunteers on activities that helped the children deepen their understanding of Taan's Moons story. 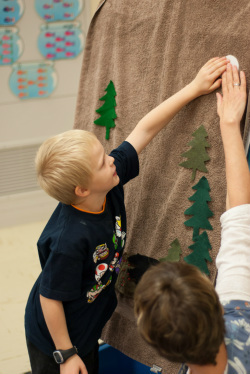 Activities like the felt board story and memory game returned, and new activities like creative writing and paper weaving invited the children to expand on the existing story with their own inventions. 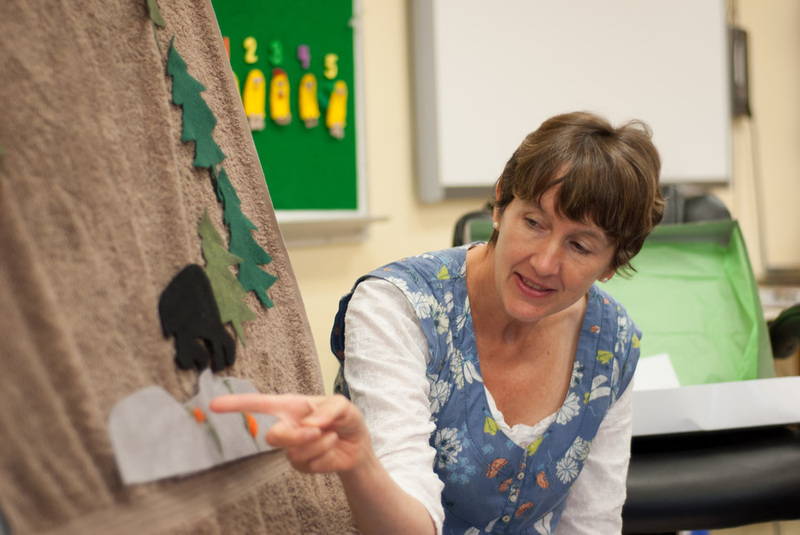 A felt play mat created by Kiki representing the year as described in Taan's Moons allowed the students to explore the sequence of the months and the story in a playful way. 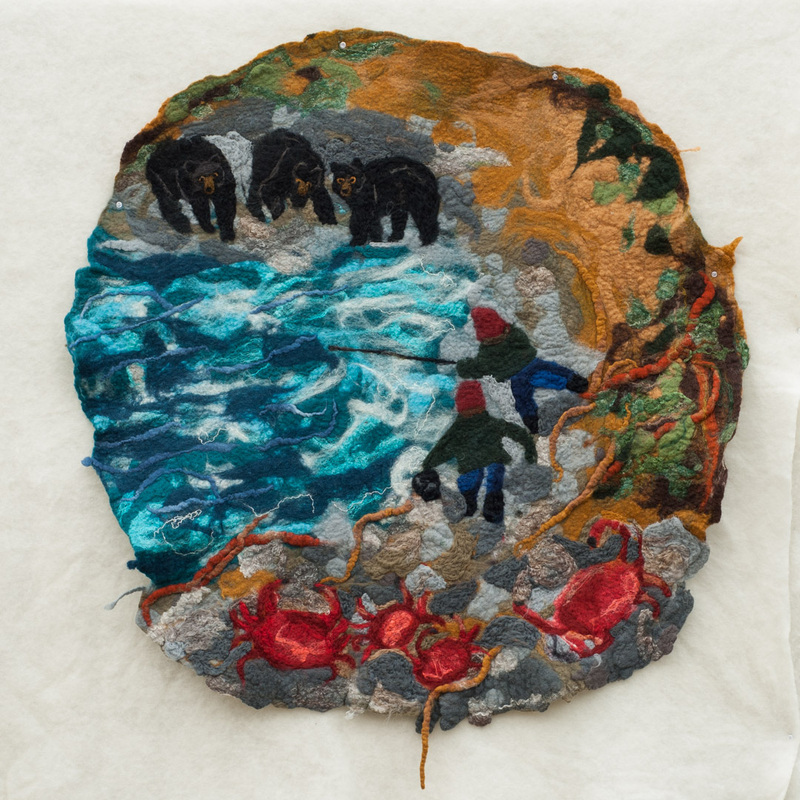 A needle felted tree housing a large bear den is the centre of a large circular wet felted piece. The piece is divided like a clock into 12 pie-shaped parts, each with a different colour and design to indicate each month and moon. 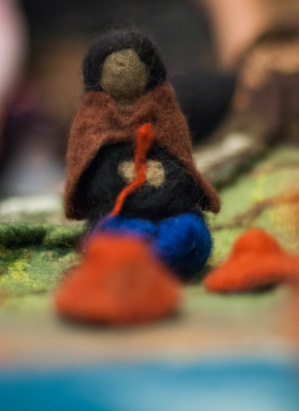 Needle felted objects include Taan the bear, three geese (for Goose Moon), a crab, an eagle, a hummingbird, a berry basket (for Raw Berry Moon and Berries Ripen Moon), a fisherman and a canoe (for Fish Moon) and a woman with cedar hats and basket for Cedar Bark Weaving Moon. 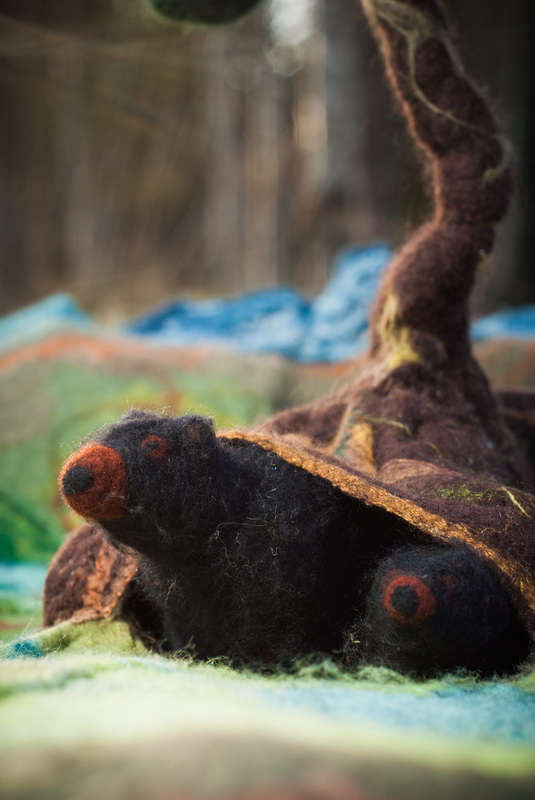 After many moons of working, we unveiled the thirteen felted Taan's Moons at Sk'aadgaa Naay Elementary School on the day of full 'Bear Moon', (January 15th, 2014). 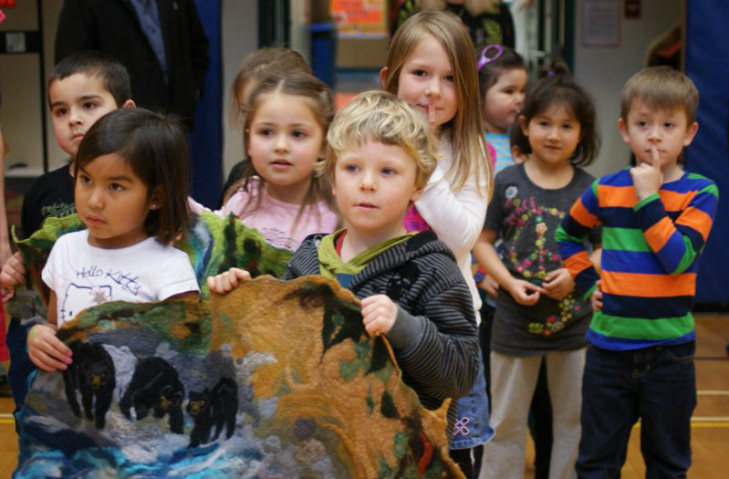 Teachers, students and their parents of three of the six participating schools, many Haida elders and other community members joined for a very special celebration of the finishing of the felt creations. 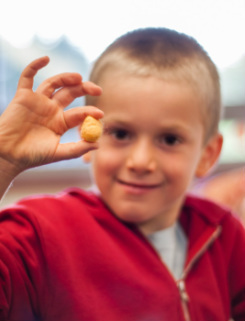 The children were so proud to bring in their pieces, and were very excited to see the other moons. Many people from the (Haida) community spoke, the story was told in Haida by Gladys Vandal and in English by Alison, Guujaaw sang a beautiful song for the poems and we enjoyed a specially made cake. For more pictures of this festive afternoon, please follow this link. Taan's Moons was displayed at ArtStarts Gallery in downtown Vancouver from April 26th till the end of August, 2014. Taan's Moons is now a published story and available at McKellar & Martin Publishing Group.